Consider the Richland Area Community Center for your next business meeting, baby shower, graduation party or special event! 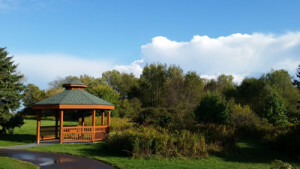 Stop by to see how we can accommodate you, call the office at 269-629-9430 or click here to drop us a note to schedule a time to view the facility. You must call to reserve your date, send a 25% deposit and pay in full 30 days prior to your event. We will send you a contract and a liability waiver that must be filled out and returned with the down payment. Note: We are a tobacco- and alcohol-free campus. The Sun Room & Kitchen is perfectly set for a shower, family gathering or strategic planning. Tables are set for 24 and an additional couch seating makes it a comfortable place for guests to gather. The long buffet counter makes a serving line easy. Room capacity is 60. Call to reserve this room for your next event. 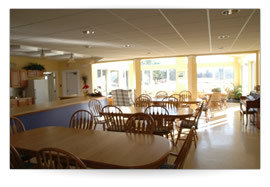 The Community Room is our largest room available for rent. With a maximum capacity of 100 this room is half carpet and half tile for appropriate dancing. Whether you’re hosting a company holiday party, a wedding or any celebratory function think of RACC’s community room for your next event. Room capacity is 100. 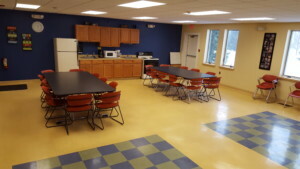 This space has a kitchenette, whiteboards, projector screen, and seating for 20. 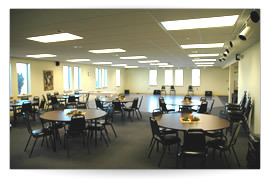 It is a flexible space that can be used to teach a class, have a meeting or celebrate a special event. Call to reserve this room for your event. Room capacity is 60.